With space at a premium and moving being both expensive and stressful, making the most of your loft for storing all those occasional-use household items could offer the ideal solution for freeing up valuable space in the home. Getting into your loft can be a bit of a chore though! Premier Loft Ladders latest product, the Escalmatic electric loft ladder, may be the perfect solution - offering style, safety and convenience. The Escalmatic combines Italian design, robust metal construction and infrared remote-controlled electrical operation. 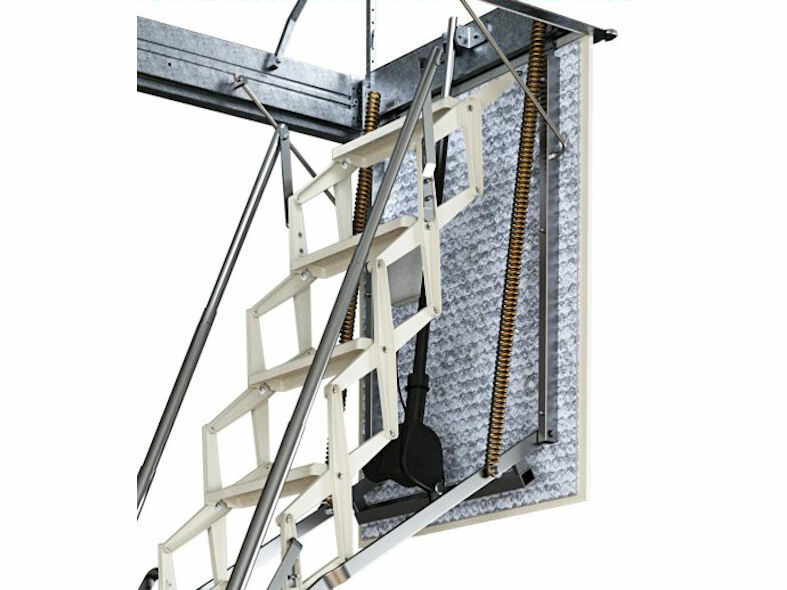 The space-saving retractable ladder mechanism also means that the Escalmatic will fit into ceiling openings from as small as 50cm wide by 90cm long, helping to avoid costly and inconvenient ceiling alterations. The Escalmatic is supplied as a ready to fit unit, comprising of a stairway manufactured from stamped sheet metal with a white finish, which is attached to a steel hatch box and insulated wooden trapdoor. 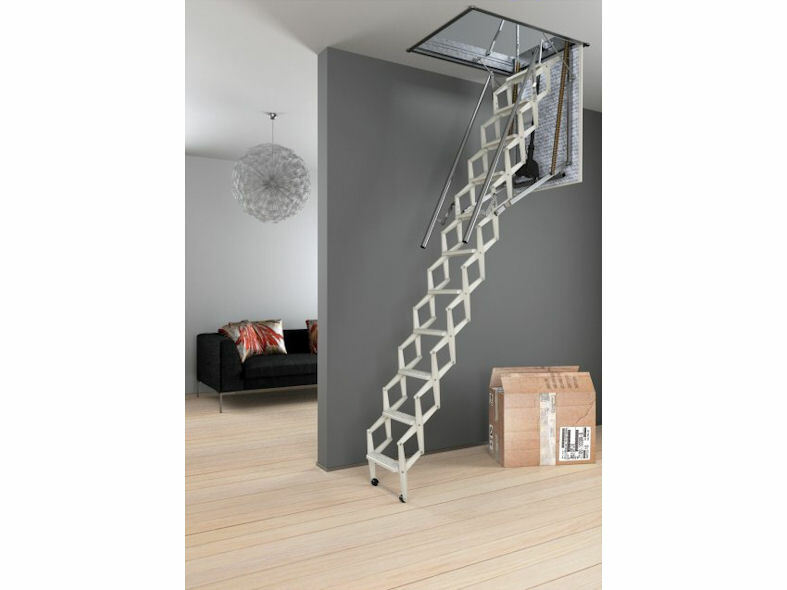 The ladder is operated by an electric motor with infrared remote control for the ultimate in convenience and comes complete with two galvanised telescopic handrails allowing for safe access into the loft, while also providing a stylish finishing touch to the ladder. Helping to keep down energy costs, the trapdoor is lined with a high-performance thermal insulating material to prevent the recirculation of hot-cold air through the attic. The optional patented 'Thermocover' provides a secondary means of thermal insulation above the loft hatch, giving a combined insulation U-value of 1.1 W/m2K. 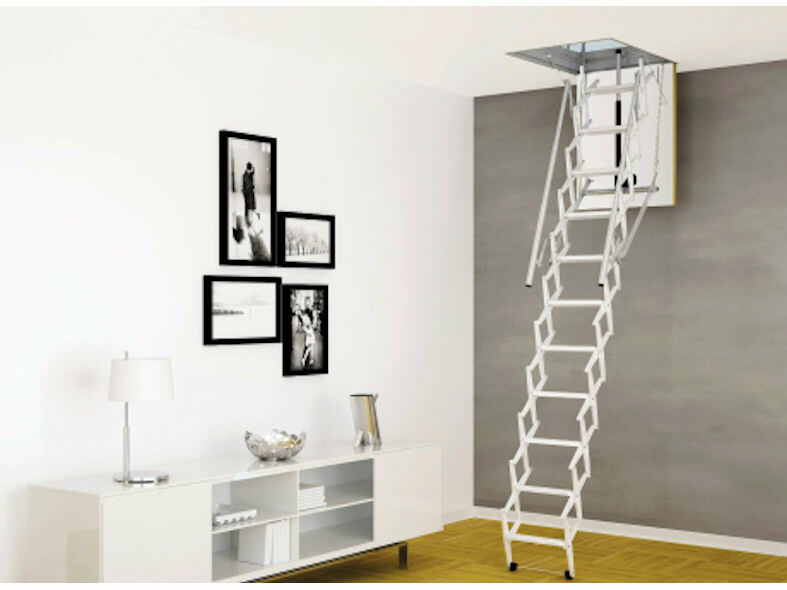 Space-saving retractable loft ladder for small ceiling openings. Energy efficient hatch box and trapdoor (U-value of 1.1 W/m2K when used with 'Thermocover'). Available in standard sizes for quicker delivery, or can be made to order to meet your exact specification.